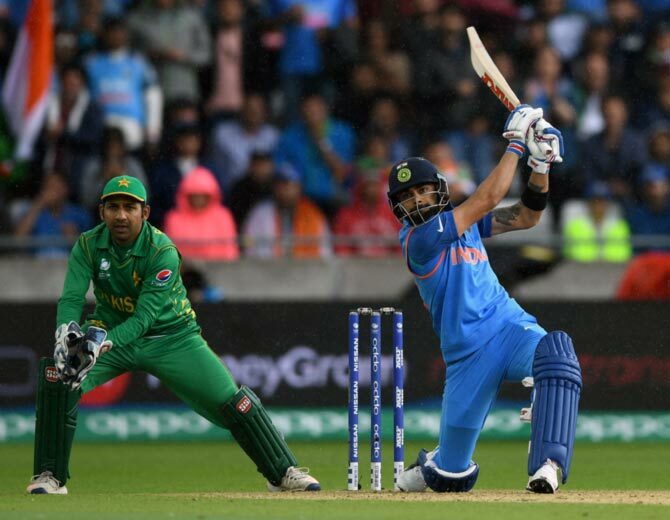 In a high-voltage clash between India and Pakistan, Defending champions India beat Pakistan by 124 runs. Batting first, Indian openers Shikhar Dhawan and Rohit Sharma got off to a great start and put up 136-runs partnership for the first wicket. After that, Dhawan was dismissed for 68 off 65 balls. The game was interrupted by rain for the first time in the 10th over and again in 32nd over. The match was then reduced to 48 overs each. Yuvraj Singh smashed his 52nd fifty off 29 balls. It was the fastest fifty by an Indian in Champions Trophy. Later on, he was dismissed LBW in Hasan Ali’s over. Captain Virat Kohli remained unbeaten on 81 off 68 balls. Both Kohli and Yuvraj consolidated the innings very well. All the top four Indian batsmen went past the 50-run mark.